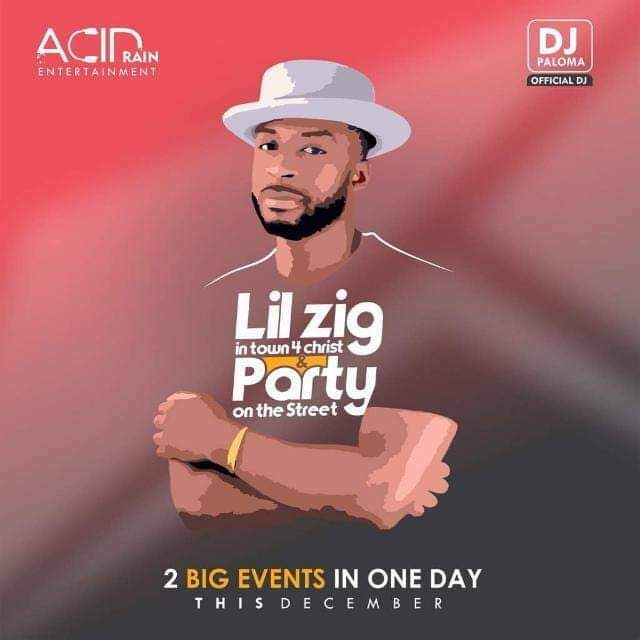 One of the finest urban gospel artists in Ghana, award winning rapper and the "Oguama Ne Mogya" hitmaker, Lil Zig In Town brings to us his most notable event "In Town 4 Christ" & "Party on the Street" this december. This year's event is a very special one as it is a 2 in 1 event. "In Town For Christ" as the name suggests is when Lil Zig unites with his colleague artists, friends and all and sundry to go into streets to evangelize/win souls to fulfil the "Great Commission. "Party on the Street" is a charity event where there will be food, drinks available to spread the message of Christ and show love to kids who live on the streets. It's a time to celebrate and unite in Christ to celebrate the birth of Christ with street kids as most of them are not privileged to enjoy the season as other kids. Most urban gospel pioneers and artists will be present. Official DJ for the show is DJ PALOMA of Zylofon fm. The 2 in 1 event will start with "In Town For Christ" at Tema Community 4, Assemblies of God church where people will walk to win souls from there to Tema Community 1. The main evangelism will take place at the Tema Community 1 market and "Party on the Streets commences after at the Tema Community 1 Centre. Call 0208840007 to grab a t-shirt for a cool ghc30 to support this worthy cause. Kindly note each purchase you make goes straight to help kids living on the Street. FOR SPONSORSHIPS/ENQUIRIES CALL: 0208840007 or 0249785100. A SOUL IS A SOUL AND IS PRECIOUS TO GOD!